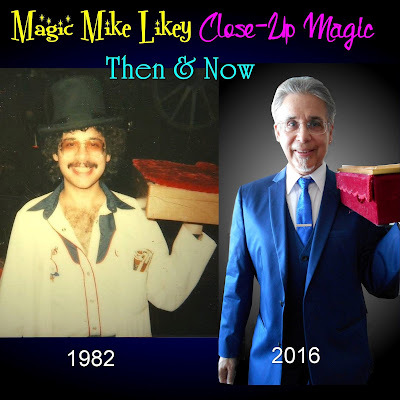 I’ve been doing magic professionally since 1981. I started doing a small stage/platform show in the summer of 1981 in Toronto, and then after my move to Winnipeg that year, I continued doing stage-magic in addition to working as a full-time Graphic Designer and Editorial Cartoonist. For my close-up/walkaround/table-to-table magic, I always used a cutlery box which I altered and painted, topping it off with a Velcroed close-up mat/pad made of crushed red velour. The case housed a myriad of trick playing-cards, coins, and many other professional magic-tricks, and I continued to use a fancy “close-up case” in one form or another until recently, late summer 2017. It was recently, for a Dairy Queen “Miracle Treat Day” promotion, that I decided to go without the heavy and cumbersome case (see picture/banner above) and work strictly out of my pockets. I had to seriously choose a dozen or less tricks from the many dozens of tricks that I had been doing for years, plus some newer ones that my case housed; to make things more challenging, I had to stuff these tricks into the pockets of my three-piece suit without looking like a stuffed turkey! Fortunately, choosing my more effective and familiar tricks was relatively easy, and stuffing them into my pockets was even easier, as I have TONS of pockets in my pants, jacket, and waist-coat. (vest) The other problems were two-fold: remembering where each trick was, (so that I don’t accidentally pull out one deck while intending to do an entirely different trick) plus the anxiety associated with this issue. After a little practice to remember automatically where everything was, I was ready. 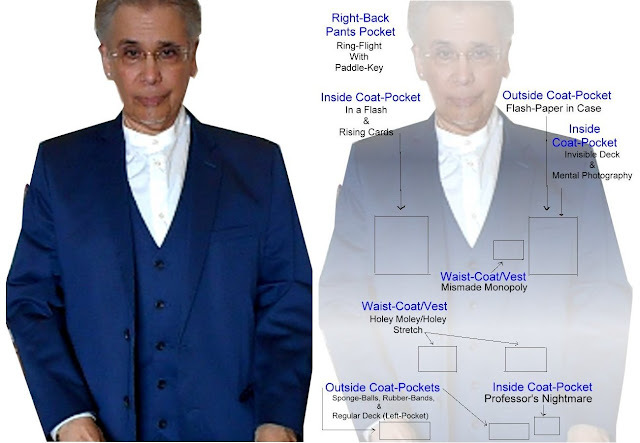 This technique of stuffing the pockets creatively and remembering where everything is is also known among professional magicians as “Pocket Management”. As stated previously, the effects had to meet some criteria, including being visually stunning and interesting, plus, in order to make me grow past the familiarity of doing the same tricks, many that I have been doing since 1981, (mainly because they are easy but look impossible to lay-audiences and are therefore “sure-fire”) I selected a few brand-new stunners, three of which were created by magical genius (and fellow-easterner) Jay Sankey! These are “Mismade Monopoly” (with my own twist of handing out the final bill, (after it had gone through numerous “transformations”) which serves as a fancy business-card, as my image and particulars are printed on this final piece of “money”; the modus operandi for this and similar “bill switches” was used by David Copperfield and Doug Henning in their television specials of the 1980’s and ‘90’s, after a technique refined by magician Michael Ammar from the original version by Mike Kozlowski! Another Sankey effect is his visual “Holey Moley” and “Holey Stretch”, in which two metal washers change in a visual and mysterious manner, eventually stretching into a longer, metal version of the original ones! Another visually stunning Jay Sankey effect called “In a Flash” involves a signed card, signed coin, and small piece of tissue-paper; the coin and the card end up somewhere after a surprising flash of fire! I included a variation of the “Invisible Deck”, also from an idea by Jay Sankey, in which a named card by a spectator (they can name, quite literally ANY card) either is the only card in the deck with an “X” on it, or sometimes all the cards have an “X” except the named card! This produces gasps every time! For the kids, I do a sponge-ball routine called “Clones”, also a rope-trick called “Professor’s Nightmare” and lead into a ring-off-rope routine culminating in the ring appearing in a key-chain; (see video!) the ring is ordinary and often borrowed from a spectator. In case no rings are present, I use my own, examined, and un-gimmicked ring. Sometimes after this, I’ll lead into a paddle-move (amateurs look that up) effect with a key from the key-case. Kids also love my colorful rubber-band routine, (see video) in which one rubber-band melts through another several times, even in a spectator’s hands culminating in the two bands linking, which I hand out as a souvenir! The idea of the bands separating from each other is an old effect, from a series of magicians’ books from the 1920’s or ‘30’s called The Tarbell Course in Magic. Sankey’s original addition is that the bands have a knot in them, as if they were broken and then re-tied. My original touch is that I use colored bands with the knots as well, and hand out the final linked pair as a souvenir, which delights everyone! More effects I carry with me are the “Rising Cards”, (mouths drop as each selected card mysteriously rises from the pack!) and “Mental Photography Deck”. (originally called “The Nudist Deck”) With the “Mental Photography” cards, the premise is the cards are all blank (you spread them out fairly, openly showing fronts and backs, then with the snap of your fingers, they turn into a full, and normal-looking deck, which you openly show fronts and backs; although this is a stunning and visual effect, almost every spectator over the years has jokingly said “now let’s see those cards”, which of course, I can’t do; I always just smile, wink, and put the deck away. This always bothered me, so I would immediately go into a non-card trick. Nowadays I ALWAYS carry with me a REGULAR pack of cards; (always “Bicycles” by-the-way!) with them I do what’s known in the trade as an “Ambitious Card” routine (amateurs look it up!) with one finale or another. Believe it or not, all of the aforementioned effects (and more!) all fit in my three-piece suit pockets; (for the details, see video and illustration) in case I have to go “backstage” between tables for refills such as rubber bands and the monopoly bills, I select an area called “home-base”: this is a quiet area, sometimes in a corner of the kitchen of the restaurant/bar where I know no-one will disturb my case filled with extra cards and those all-important refills! 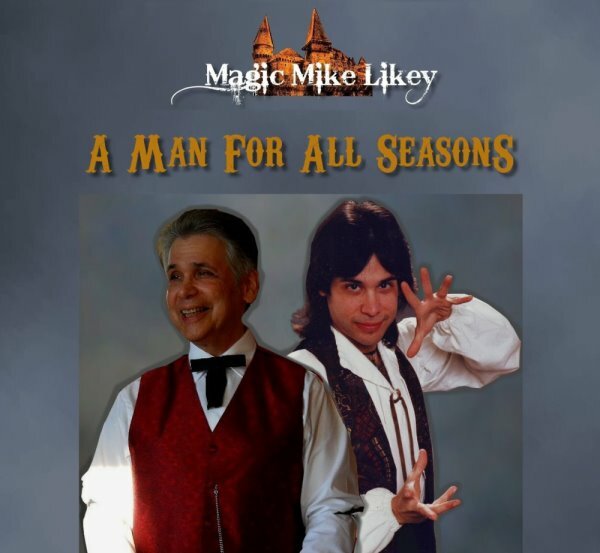 I hope that some of this information has been or will be useful to you both as an up-and-coming magician and as a working pro! Remember “Pocket Management” and you won’t go wrong!